KUBRAT PULEV AGAINST "MR X"
On Tuesday (March 15) Team Sauerland headed by Kalle Sauerland will stage a press conference at the Barclay Arena (formely O2) in Hamburg to announce a big show headlined by heavyweight Kubrat Pulev (22-1). The opponent is billed as ”Mr X” but according to Sauerland´s Twitter flow an agreement is in place with Dereck Chisora (25-5) and other sources as well confirm that it is indeed Chisora that is ”Mr X”. Both fighters are promoted by Sauerland. At stake is the vacant EBU title and the EBU website have since some time confirmed that there is an agreement for this site. Sauerland are looking at a date in May. 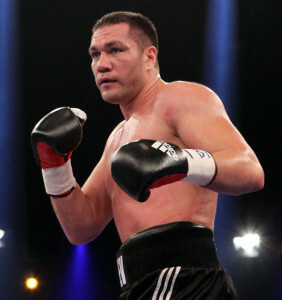 Pulev from Bulgaria and Chisora from the UK may on paper not be big draw in Hamburg but there are many Bulgarians in Germany and both men are well known from their fights with the Klitschko brothers (Pulev against Wladimir and Chisora vs Vitaly). As for co-feature it could be that WBA interim superwelter champ Jack Culcay will defend the title.